Hi Abites - today on the blog I am pleased to share my review of Salvation Jane by Ann Massey - it is chick lit with a message. I was given a copy of this book in exchange for an honest review, which I gratefully accepted because I enjoyed the author's two previous books,The Biocide Conspiracy and The White Amah. Jane Patterson is a typical Australian city girl, who has just broken up with her philandering boyfriend when she inherits a hotel from her recently deceased uncle on the other side of the country. She moves to collect her inheritance believing she is going to build a new, more prosperous life for herself as a business owner. What she finds isn't quite what she expected. Her hotel is actually low rent accommodation for homeless men, and is full of the smelly, unwashed dregs of society. She is horrified, dismayed, and determined to spruce the place up and turn it into a backpackers hostel which will flourish with the tourist trade. Along the way though, she learns that maybe not everything is as she assumed. Maybe, just maybe, the homeless don't choose to be homeless. This book is set in Perth, Western Australia and is full of Australian flavor and Australian terminology and pop culture references. One of my favorites is "it's going straight to the pool room" which is a line showing pride and appreciation from a classic Australian movie, The Castle. As an Australian resident, who is horribly ignorant regarding the Australian political system, I also found it educational. 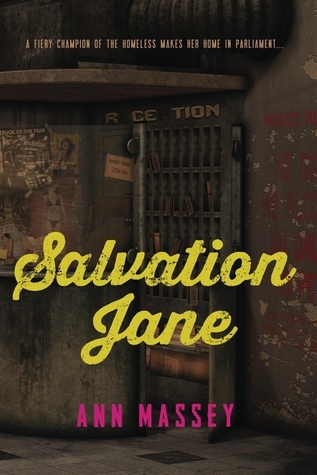 Salvation Jane reads like chick lit, but has a message and a moral. A very welcome addition to the collective works of author Ann Massey. Want to buy Salvation Jane? Click here to get it at Amazon. Also, check out The Biocide Conspiracy and The White Amah. As Australia sinks into depression a new political party delivers hope to the poor. The brainchild of Jane Patterson, the new independent MP holds the balance of power. But when the fiery champion of the homeless compels the minority government to support her radical reforms, faceless power-brokers plot to destroy her. SALVATION JANE is a fast-paced contemporary political novel woven in reality and based on the 1990s conspiracy to have a political rival unfaily jailed for electoral fraud. It confronts head-on one of the most current issues of the decade: the working poor. I grew up in the tough environment of a council estate, in north-west Bolton. After emigrating to Australia at fifteen, I worked at various lacklustre jobs before going to live in the jungles of Borneo. It was at this time that I began to record heart-wrenching stories of the sexual exploitation of Iban girls, portrayed in THE WHITE AMAH. A stint as a governess on an outback sheep station close to the Carnarvon Space Obsevatory provided the setting for my next book, THE BIOCIDE CONSPIRACY. My new release, SALVATION JANE is about a new and idealistic MP and an ambitious politician out to make a name by scapegoating the homeless. I live in Perth, Western Australia. Check out Ann's blog at http://cannotletthispass.blogspot.com.au. Poverty and homelessness are causes that Ann feels deeply about. What are some of your hot button causes?